What kind of issues? 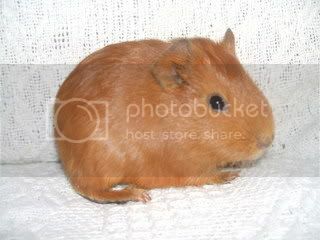 I've never had a guinea pig with scurvy, I'd feel like a pretty bad guinea-pig owner if one did, it's not hard at all to give them the right amount of vitamin C.
If you got him from the pet store with this problem, it's not your fault. It's sadly common as most don't feed veggies, just low-quality pellets with unstabilized vitamin C.
Vitamin C deficiency can be secondary to other medical problems. For example, a guinea pig with malocclusion that is not eating and losing weight, may not be getting adequate vitamin C.
It is wise to routinely provide extra vitamin C to an ill guinea pig. The malocclusion part particularly rings a bell with me since he's drooling. He could have scurvy because he can't eat very well. Oh wow the hopping and stiff joints could definitely be from Scurvy, that would be good -- as it's cureable! Hopefully... it doesn't actually say if the symptoms will go away or not. And yes, with the drooling I've wondered since she first told me if it was actually his teeth/mouth. When they told me he was 'deformed,' and had a habit of 'drooling,' I was like hmm.. teeth.. must be his teeth. But I didn't say anything, cos if something goes wrong in the first week they have to pay... and they said he stopped eating, and I do notice they give vegies (though how much, and how good it is I don't know...) so it's a possibility it is an underlying problem that caused him to get scurvy.